A new graphics card launch is always anticipated and NVIDIA’S RTX 20 Series Graphics Cards were certainly no exception (as many of you could probably tell from both the online buzz and the company’s hyped-up conference for the graphics card’s incoming ray-tracing features). Following the release of NVIDIA’s latest GPU’s in August, it quickly became clear from NVIDIA’s GeForce RTX 2080 specs and the 2080 benchmarks which of the NVIDIA graphics cards was going to be the most sought after for the latest power and features. But what did the reviewers think? Rather than just give you our opinion, we’ve compiled a list of technology’s best online experts and personalities discussing everything from benchmarks to the RTX 2080’s price to give you a varied and fair consensus on the opinions of the GPU. Let us know your thoughts and what you think! All credit goes to the respective owners of said videos. An unbiased look at Nvidia’s RTX 2080s from HardwareCanuck, comparing the power of the RTX 2080 with its high-end price tag. This video is as insightful as ever from the hardware Youtubers; great for customers that are sceptical of the 2080’s intimidating price. The following video discusses Nvidia’s RTX 2080’s many features, from NVLink to the current games that are available to benefit from the 2080’s ray tracing features. It also goes over the RTX 2080’s basic benchmarks for Battlefield 1, Destiny 2 and Forza 7. According to HardwareCanucks, the RTX 2080 dominates benchmarks and is one of the quietest cards that they have ever experienced. They found that even when it was boosted to the highest framerates, the RTX 2080 remained passively quiet. Its average 4K gaming FPS was also almost as fast as the GTX 1080 Ti. Watch the video for yourself and decide your own verdict! Summarising the video, HardCanuck is skeptical of the reasons that Nvidia is using to justify the RTX 2080’s price. However, they continue to say that the GPU is ideal for those that are looking to upgrade their PC for future games that will be graphically intensive and demanding. Steven from Hardware Unboxed starts the video - in a rare case with technology reviews - by admitting that he was WRONG about his speculations with the RTX 2080! Indeed, it seems that he underestimated the power of Nvidia’s RTX 2080 graphics cards. In the video, Steve goes over a titanic number of benchmarks that he did for the RTX 2080, with games including Battlefield 1, Far Cry 5, Arma 3, GTA V, Hitman, No Man’s Sky, Project Cars 2, Rainbow 6 Siege, Shadow of the Tomb Raider, Strange Brigade, Vermintide 2, and Wolfenstein 2. Wow, that’s a lot of sequels! The video goes into great detail about the power – and lack of – for these specific games. Steve does mention that the RTX 2080 cards are boosted by overclocking, however, he does sum up this point by revealing that the GPU is already powered pretty well for the games that users may wish to play. Steve summarises this video by asking us a simple question, will you care for ray tracing if the feature doesn’t affect the games that you play? If so, the RTX 2080 may not be for you. Tom Logan, director and chief editor of OC3D TV, goes into detail about his thoughts on the RTX 2080 GPU in another video from his hit Youtube technology channel. Tom discusses his opinions on ray tracing and goes into detail about the benefits of ray tracing as a feature for graphics card-intensive gaming and film SFX work. He also mentions that for the general consumer, it is probably best to wait for ray tracing to develop a bit more because of a DXR update. Tom summaries ray tracing as a cultural change for gaming and PC culture, and is excited for the promises that it will bring to the standard PC user. At one point he is lost for words at how the Star Wars demo looked in-person and says that it is something that must be experienced first-hand in order to grasp the full power that ray tracing brings to make games appear like Hollywood-level films. Like the majority of the videos on this list, OC3D TV’s video contains detailed gaming benchmarks for gamers that are interested in the gaming power of the RTX 2080 for their own PC. Tom’s main excitement seems to be for the possibilities of DLSS. He also likes the hardware for the RTX 2080 and goes on to call it a ‘grown-up design’. However, he is concerned that the design itself may not be aesthetically pleasing for PC builders and it its lack of RGB or interchangeable colour options may make it stick out in people’s computers. The video finishes with Tom surprisingly justifying the price because of the performance that the RTX 2080 brings to the common market but tells us to wait for more content to be brought to its features. Jason from JayZTwoCents explores whether Nvidia is hiding something with their lack of gaming performance metrics during their 2-hour keynote RTX 2080 unveil. He concludes that Nvidia’s RTX 2080 has a 70% performance increase that justifies the 70% price increase from Nvidia’s predecessor GPUs. As well as benchmarks for games such as Shadow of the Tomb Raider, Gamers Nexus discuss the users that will benefit from the RTX 2080; games developers and high-end media workers that will be able to fully utilise the card’s features. They conclude that from a gaming standpoint, there needs to be a future development that justifies the graphics card price. But make sure that you get your own opinion! 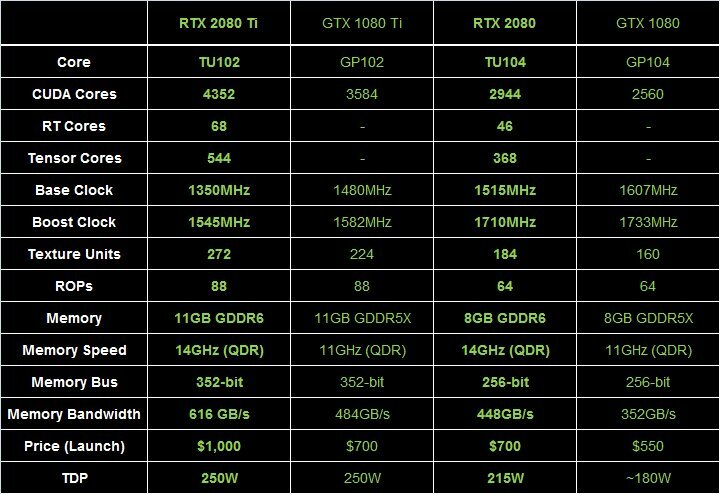 Below we have a comparison of the latest specs for both graphics cards from the latest RTX series. You can view our whole range of NVIDIA RTX 2080 Graphics Cards here and our whole range of NVIDIA RTX Graphics Cards here.